Prairie School by renowned children’s author Avi tells the story of Noah Bidson growing up on the prairies of Colorado. One day, his Aunt Dora arrives and begins teaching Noah reading, writing, and arithmetic. Noah is hesitant at first, trying to find ways to avoid studying. However, once Aunt Dora begins teaching him outside on the prairie, Noah discovers the joy of learning, and his life changes forever. Animal Folk Tales of America contains many famous stories told throughout American history, adapted by Caldecott Honor-winner Tony Palazzo. 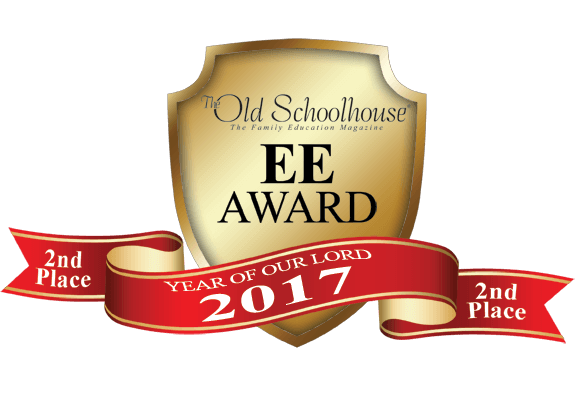 Legends in this text include Paul Bunyan, Pecos Bill, The Jumping Frog, Davy Crockett, Johnny Appleseed, Sweet Betsy, and others. Your student will explore magnificent landscapes and discover legendary deeds as they come to know and love these treasured tall-tales! 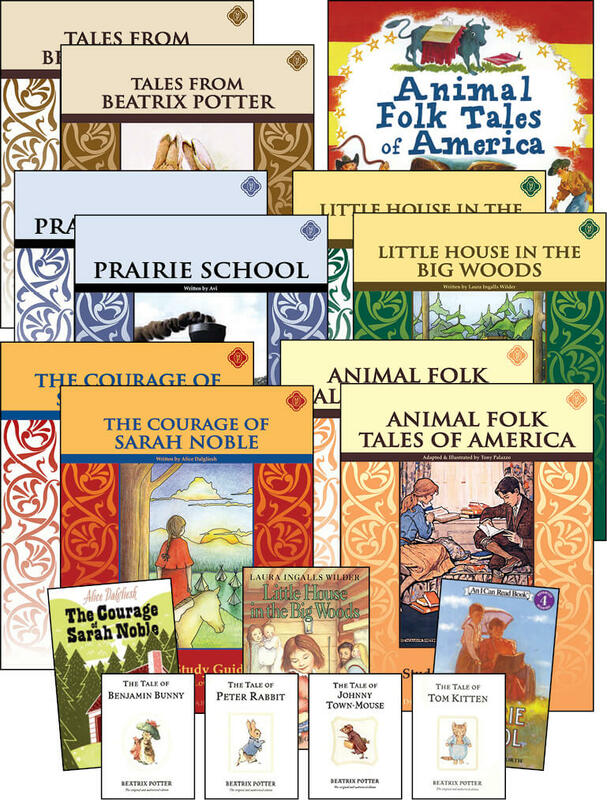 The Animal Folk Tales of America Student Guide and Animal Folk Tales of America Teacher Guide help students understand as well as love these classic tales. The Newbery Honor-winning The Courage of Sarah Noble by Alice Dagliesh dramatizes a young girl's struggle in colonial America. Eight year old Sarah Noble and her father travel through the wilderness of Connecticut in 1707 to build a new life. As Sarah and her father live in the wilderness, Sarah sometimes finds it hard to be brave when there are strange noises in the woods. However, Sarah soon makes new friends in her wilderness home, and when she must stay alone while her father goes to fetch the rest of the family, Sarah learns what it really means to be brave. Little House in the Big Woods by Laura Ingalls Wilder remains an all-time American classic about life on the frontier. The first book in the beloved Little House series begins in 1871 in a log cabin on the edge of the Big Woods of Wisconsin. Four year old Laura, her Pa, her Ma, her sisters Mary and Carrie, and their dog, Jack all live happily together in the little house. Life as a pioneer is not always easy, especially when preparing for the long Wisconsin winter. But there is also joy and fun as Laura and her family celebrate Christmas, plant crops every spring, harvest in the autumn, and make trips into town. This heartwarming story will introduce students to America's frontier history through the eyes of a young girl growing up in the safe, warm, and love-filled little house. The Tale of Tom Kitten is set in the cottage garden Beatrix created herself at Hill Top, the farm she owned near the village of Sawrey. On the day their mother has guests to tea, the three kittens Moppet, Mittens, and Tom get into mischief and ruin their nice clothes by climbing the garden wall and playing with the Puddle-ducks. Your student is sure to love this quaint and endearing tale of three playful kittens set in a beautiful British garden. The Tale of Peter Rabbit was first published in 1902 and endures as Beatrix Potter's most popular and well-loved tale. It tells the story of a very mischievous little rabbit and the trouble he encounters in Mr McGregor's vegetable garden! In the Tale of Johnny Town-Mouse by Beatrix Potter, Johnny Town-Mouse and Timmy Willie, a country mouse, trade places. When they end up in each other's worlds they soon discover that they were much happier where they started! The Tale of Benjamin Bunny is an original classic by Beatrix Potter. Peter Rabbit's cousin, Benjamin Bunny, has been a very popular character since this book's first publication in 1904. In this tale, we hear all about the adventures of Benjamin and Peter in Mr. McGregor's vegetable garden, and what happens to them when they meet a cat! Even more frightening, is what happens to the two pesky bunnies when old Mr. Bunny finds out what they have been up to! Prairie School by renowned children’s author Avi tells the story of Noah Bidson growing up on the prairies of Colorado. One day, his Aunt Dora arrives and begins teaching Noah reading, writing, and arithmetic. Noah is hesitant at first, trying to find ways to avoid studying. However, once Aunt Dora begins teaching him outside on the prairie, Noah discovers the joy of learning, and his life changes forever. Our Prairie School Student Guide trains students to become active readers by providing in-depth word studies that help students build vocabulary as well as comprehension questions to teach students to identify important concepts and compose clear, concise answers to questions. Animal Folk Tales of America contains many famous stories told throughout American history, adapted by Caldecott Honor-winner Tony Palazzo. Legends in this text include Paul Bunyan, Pecos Bill, The Jumping Frog, Davy Crockett, Johnny Appleseed, Sweet Betsy, and others. 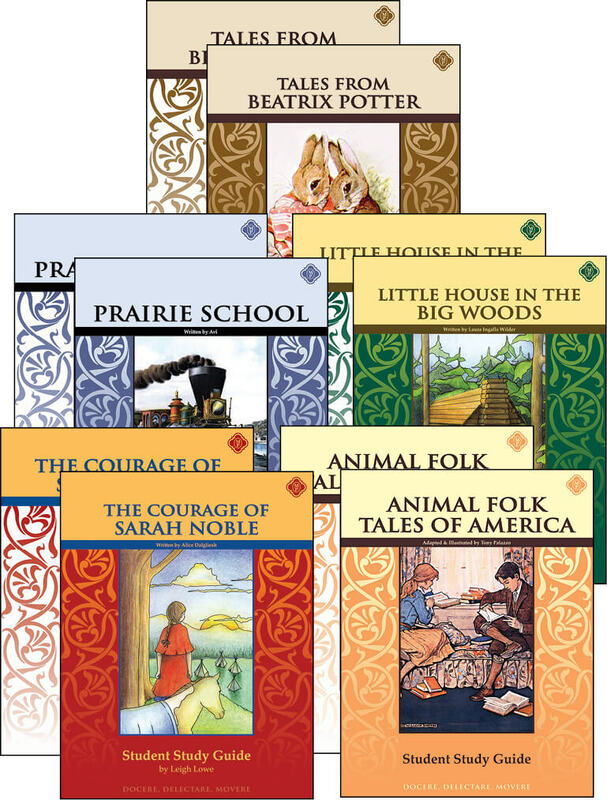 The Animal Folk Tales of America Student Guide trains students to become active readers by providing in-depth word studies that help students build vocabulary as well as comprehension questions to teach students to identify important concepts and compose clear, concise answers to questions. The Newbery Honor-winning The Courage of Sarah Noble by Alice Dagliesh dramatizes a young girl's struggle in colonial America. Eight year old Sarah Noble and her father travel through the wilderness of Connecticut in 1707 to build a new life. As Sarah and her father live in the wilderness, Sarah sometimes finds it hard to be brave when there are strange noises in the woods. However, Sarah soon makes new friends in her wilderness home, and when she must stay alone while her father goes to fetch the rest of the family, Sarah learns what it really means to be brave. The Courage of Sarah Noble Student Guide trains students to become active readers by providing in-depth word studies that help students build vocabulary as well as comprehension questions to teach students to identify important concepts and compose clear, concise answers to questions. Little House in the Big Woods by Laura Ingalls Wilder remains an all-time American classic about life on the frontier. The first book in the beloved Little House series begins in 1871 in a log cabin on the edge of the Big Woods of Wisconsin. Four year old Laura, her Pa, her Ma, her sisters Mary and Carrie, and their dog, Jack all live happily together in the little house. Life as a pioneer is not always easy, especially when preparing for the long Wisconsin winter. But there is also joy and fun as Laura and her family celebrate Christmas, plant crops every spring, harvest in the autumn, and make trips into town. This heartwarming story will introduce students to America's frontier history through the eyes of a young girl growing up in the safe, warm, and love-filled little house. Our Little House in the Big Woods Student Study Guide trains students to become active readers by providing in-depth word studies that help students build vocabulary as well as comprehension questions to teach students to identify important concepts and compose clear, concise answers to questions. The Beatrix Potter Student Guide is a comprehensive workbook for your student to use while working through four short tales by Beatrix Potter including The Tale of Tom Kitten, The Tale of Benjamin Bunny, The Tale of Johnny Town-Mouse, and The Tale of Peter Rabbit. Prairie School by renowned children’s author Avi tells the story of Noah Bidson growing up on the prairies of Colorado. One day, his Aunt Dora arrives and begins teaching Noah reading, writing, and arithmetic. Noah is hesitant at first, trying to find ways to avoid studying. However, once Aunt Dora begins teaching him outside on the prairie, Noah discovers the joy of learning, and his life changes forever. 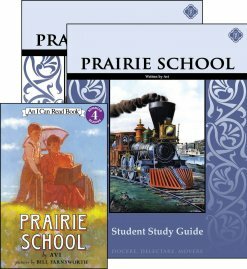 Our Prairie School Teacher Guide contains the answers to the Student Study Guide and will enable educators to aid the student in developing vocabulary and reading comprehension skills. 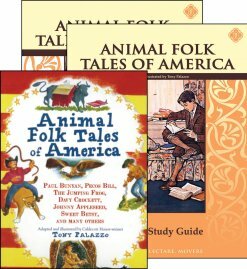 Animal Folk Tales of America contains many famous stories told throughout American history, adapted by Caldecott Honor-winner Tony Palazzo. 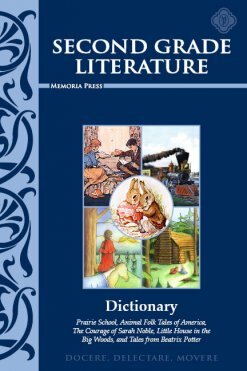 Legends in this text include Paul Bunyan, Pecos Bill, The Jumping Frog, Davy Crockett, Johnny Appleseed, Sweet Betsy, and others. 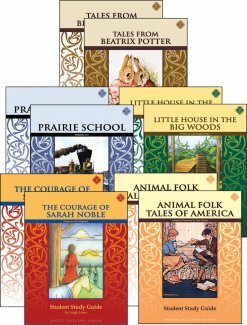 The Animal Folk Tales of America Teacher Guide contains all answers to the Student Study Guide. The Newbery Honor-winning The Courage of Sarah Noble by Alice Dagliesh dramatizes a young girl's struggle in colonial America. Eight year old Sarah Noble and her father travel through the wilderness of Connecticut in 1707 to build a new life. As Sarah and her father live in the wilderness, Sarah sometimes finds it hard to be brave when there are strange noises in the woods. However, Sarah soon makes new friends in her wilderness home, and when she must stay alone while her father goes to fetch the rest of the family, Sarah learns what it really means to be brave. 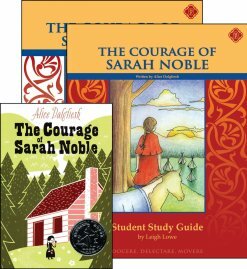 The Courage of Sarah Noble Teacher Guide contains the answers to The Courage of Sarah Noble Student Guide. Little House in the Big Woods by Laura Ingalls Wilder remains an all-time American classic about life on the frontier. The first book in the beloved Little House series begins in 1871 in a log cabin on the edge of the Big Woods of Wisconsin. Four year old Laura, her Pa, her Ma, her sisters Mary and Carrie, and their dog, Jack all live happily together in the little house. Life as a pioneer is not always easy, especially when preparing for the long Wisconsin winter. But there is also joy and fun as Laura and her family celebrate Christmas, plant crops every spring, harvest in the autumn, and make trips into town. This heartwarming story will introduce students to America's frontier history through the eyes of a young girl growing up in the safe, warm, and love-filled little house. 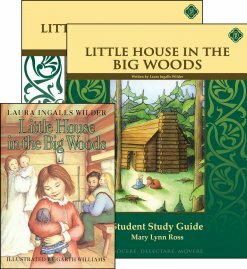 Our Teacher Guide contains answers to the Little House in the Big Woods Student Study Guide. 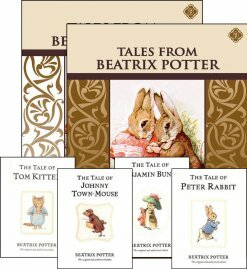 The Tales from Beatrix Potter Teacher Guide covers four books by Beatrix Potter (The Tale of Peter Rabbit, The Tale of Benjamin Bunny, The Tale of Tom Kitten, The Tale of Johnny Town-Mouse) and contains the answers to the Beatrix Potter Student Study Guide. This set includes the corresponding novels for the literature guides. Children who are asked to read slightly above their comfort level will develop into superior readers. Our reading program for grades 2-7 continues the development of reading skills through universally recognized classic literature. Reading is not a passive activity for pleasure. Reading requires an active, discriminating mind that is challenged to think, compare, and contrast. Students who have been challenged by good literature will never be satisfied with the poor-quality books that are so readily available today. Need Lesson Plans for Second Grade Literature?